Your list of “Must See” while your here! 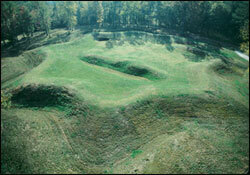 The National Park is the site of the First Land Battle in the South during the American Revolution. The site is holder of two American Revolution War records being the First Land Battle South of New England and the Longest Siege in the War. The site is also home to the only world-wide remaining Star- Shaped fort built by the British left, giving the site it’s name. The NPS site also houses the only Patriot dug tunnels left in the County. The 125 foot tunnel dug by Thaddus Kosciusko under the direction of General Nathaniel Greene during the siege, was studied and filmed utilizing a 3D camera during the summer of 2014 by the South Florida College of Art and Science Department. The 3D film can be viewed on this sites home page as well as at the Park. See the page. 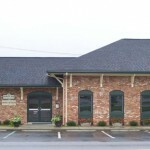 Lake Greenwood State Park Recreation Area is a great place for business meetings,family gatherings or wedding receptions.The DRUMMOND CENTER offers a spacious conference room can hold up to 200 people for a meeting or 140 for sit-down dinner. Guests can stroll out to the stone terrace for a spectacular view of Lake Greenwood. The grassy knoll overlooking the lake is a popular spot for wedding ceremonies.The Center also houses a CCC Museum,free and open to the public.The lake is also home to Bass Pro Masters Crappie Fishing Tournament held annually each February.The lake is known for crappie fishing. For reservations call (864) 543-3535.The park is an hour drive from both Greenville, SC and Columbia, SC. See the page. The Depot, on the National Registry is one of the oldest buildings in the Town of Ninety Six, built by Norfolk Southern Railway in 1852. In 1856 US Senator Preston Brooks held his re-election speeches here after resigning for striking US Senator Charles Sumner of Massachusetts on the Senate floor with his cane. Over 10,000 people attended the re-election speeches, as well as the NY Times and hundreds of canes were sent from all over the South. The Depot has been preserved and currently still serves the community as a Community Center. Two State Historic Signs are located at the depot. The original desk and telegraph can been seen today at the 96 Visitor Center. In 1885 Henry Jefferson Kinard,a local businessman and farme, built this Victorian Era home.It was constructed with lumber from nearby forests and features heart pine floors as well as decorative fireplaces, french doors, two foyers and a central staircase, all original to the house.The Kinard House has been lovingly restored and is a private residence today.The home is listed on The National Register of Historic Homes. Mr.Fouche,one of the first prominent Ninety Six merchants,and he built this lovely house circa 1848-1852. In 1867, Fouche hosted a meeting of four of the state’s leading Baptist ministers at the house to decided whether or not to reopen the Baptist Theological Seminary founded in 1826. This meeting led to the birth of the current day Furman University located in Greenville,South Carolina. St. Paul United Methodist Church located North Cambridge Street. In 1875 the church was inspired by Sallie Lipscomb. As young Miss Lipscomb lay dying, she said to her mother, “please, I want the two dollars I earned to be used to start the new church”. 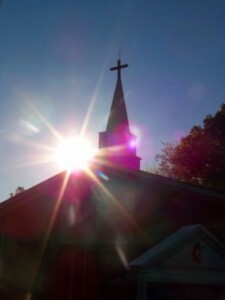 Using the two dollars as a start, Methodists in Ninety Six built the church. On March 26, 1876 Bishop William M. Wightman dedicated Saint Paul Methodist Church located on Cambridge Street. Across the street is the Ninety Six Presbyterian Church. Presbyterianism began in this area around 1774. The church was dedicated on Friday, July 13th, 1860. General James Gillam provided a location and 75 people made contributions ranging from $1 to $100 to raise $1,503. The church still holds the original slave balcony inside and a cemetery is located directly behind the building. The stone Fountain, located on Main Street stands beside the Visitor’s Center. 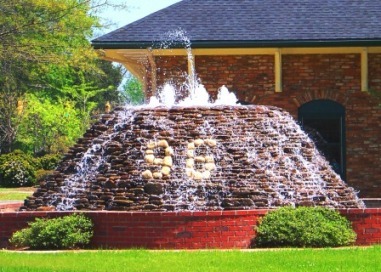 The Historic Ninety Six “Star Fort” Fountain is the centerpiece of the downtown serving as a gathering place for locals and tourists seeking relaxation and a great place to spend time with family and friends. 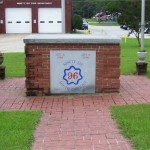 It is also a great place to take vacation photos as the number 96 is laid within the Pennsylvania field stone. The fountain, constructed in 1998, was the result of years of leadership by the Historic Ninety Six Development Association, former Mayor Charles Harts, William “Bill” Gardner, and the support of the entire community to implement the downtown improvement plan prepared by Jason Epley, a graduate student of Clemson University in 1996. The fountain design was inspired by the nearby Ninety Six National Historic Site, its history, and the Star Fort itself. 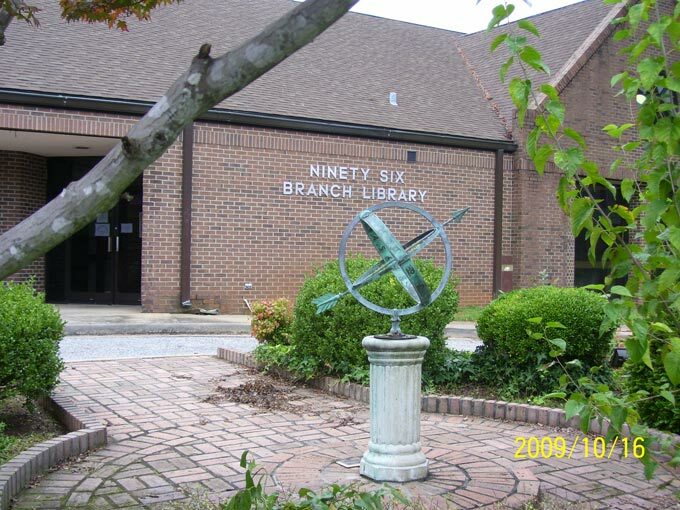 The Ninety Six Visitors Center is appropriately located in the center of Town in the Town Square. 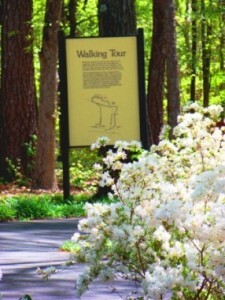 Visitors can pickup brochures or watch the kiosk for an information video about Ninety Six and its surrounding area. The Center houses The Tourism Department, The Historic 96 Development Association and 96 Chamber of Commerce. The facility also provides an exhibit/meeting room for displaying local artisans arts and crafts and Ninety Six memorabilia. The 96 Visitor Center, 97 Main Street (Hwy 34) Ninety Six, SC 29666 (864) 543-4820 See the Tourism Page . 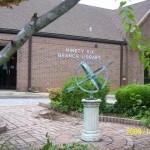 The Ninety Six Branch Library is a branch of the Greenwood County Library, www.greenwoodcountylibrary.org. 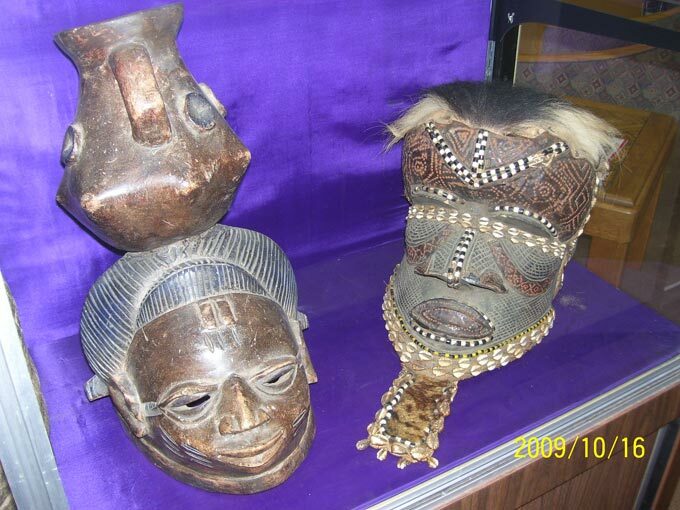 The library is a resource of books for pleasure and reference and cultural interests. The library has a beautiful hand painted mural, “Reading is Essential”, by local artist Louise Aull. The mural pictures ways in which reading is important. It shows elements of Ninety Six history as well as seventeen (17) state symbols of South Carolina and a picture walking trail everyone can enjoy. The mural was presented by NS DAR- Mount Ariel Chapter and sponsored by the Ninety Six Book Club. 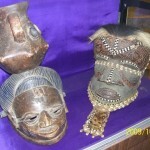 The library also houses an exhibit of African artifacts, a gift of Richard Tolbert from Liberia and New York. 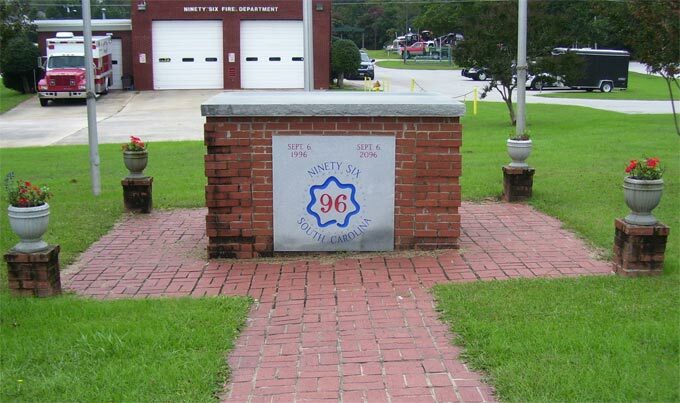 Mr. Tolbert’s roots were in Ninety Six. His ancestors came from Africa to Ninety Six where they were farmers. In 1878, the Tolberts sold all of their possessions, bought a ship and sailed to Liberia. After becoming wealthy farmers, they became leaders in their country with special interests in economic development and education. Located at 100 South Cambridge Street Ninety Six, SC 29666, Telephone 864-543-4749 for more info. Another focal point on the square in Historic Downtown 96 is: THE GAZEBO. According to former 96 Chamber of Commerce member and local business owner Clara Able, the 96 Chamber of Commerce solicited donations and funds for this project in the 1980’s. 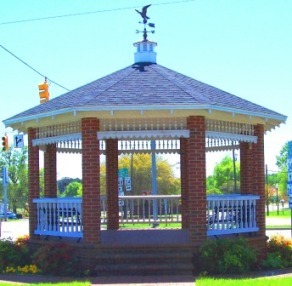 The construction of THE GAZEBO was completed in 1987.Each brick that was laid into place was donated by Hanson Brick, then known as SOUTHERN BRICK. No cost of this project was incurred to the Town of 96-as it was a community project. According to the records and research by the 96 Chamber of Commerce, the total price of the gazebo project was $18,339.41. The Chamber search also yielded signed drawings of architect J.C. Lake that were dated 3/12/1986. It is a lovely place to take a quick break while walking through Town. HISTORIC DOWNTOWN TRAIL: One of our most popular walking trails is located in the heart of our historic downtown area and runs parallel to Main Street (Highway 34). You may park at the Historic 96 Depot to start your walk. This trail is 1.4 miles long and is open from dawn until dusk, unless otherwise posted. The Walking Trail runs east and west from the Depot to the town limit on what was formerly a railroad bed. Paved with rock dust, the trail is level, straight and is also handicap accessible. There are benches along the trail. 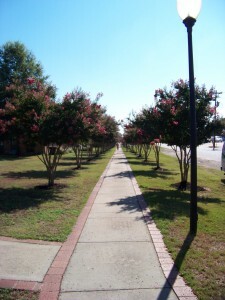 THE NINETY SIX TOWN PARK TRAIL : This asphalt trail is a .3 mile loop that completely surrounds the town park. It is located on the corner of Saluda and Cross Streets.Amenities include water fountains, restrooms, picnic tables, a playground and pavilion. 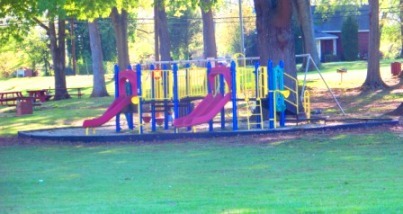 There is also plenty of open space for one open up a blanket for a picnic or to play frisbee or dodgeball! This is a 1 mile loop that is located on Highway 248 South-just 2 miles from Downtown Ninety Six. This walking trail shows nature at its best and is actually located inside a National Historic Site!This asphalt trail passes Colonial and Revolutionary era historical points as well as being a very popular spot for nature lovers, history buffs and bird watchers. Amenities: restrooms, information center, picnic tables and water fountains. Pets on a leash are welcome. The last formal event commemorating Ninety Six’s 9-6-1996 year was the time capsule dedication on the square. The time capsule included film clips, newpaper articles, photographs and many items that were in some way connected to the celebration. Also included was the sequential scroll, which is signed by thousands of South Carolinian’s. The capsule, a hermetically sealed container, was placed in a sealed above-the-ground monument on the west side of the town’s gazebo on the flag square. The granite and concrete structure measures, 4 feet wide, 6 feet long and 30 inches high. 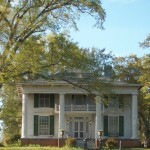 Located on Hwy 246 S, the house was built sometime around 1849 in what was once a part of Edgefield County by Whitfield Brooks, father of US Senator Preston Brooks (see Famous residents page). He moved to the property and occupied a smaller house. He later moved a small house to the property and joined it with his house. He added a new front and called the house Roselands. The house served as a working plantation and as many as 93 slaves worked the land according to the 1850 census. In the 1850s – Mary Parsons Carroll Brooks (Whitfield’s wife) had an Episcopal Chapel built on the property for family use. It was dismantled at some point and three tablets in memory of her husband, son Whitfield, and son Preston Smith Brooks were removed to the Episcopal Church in Edgefield County. Whitfield passed away and the house remained in the family until the 1970’s. Today the home, is a private residence. A State Historic Marker has been placed by the SC DAR along side the former plantation.